Cash back websites are on the rise, but who is the most generous? This post is sponsored by TopCashback.com. All opinions are my own. 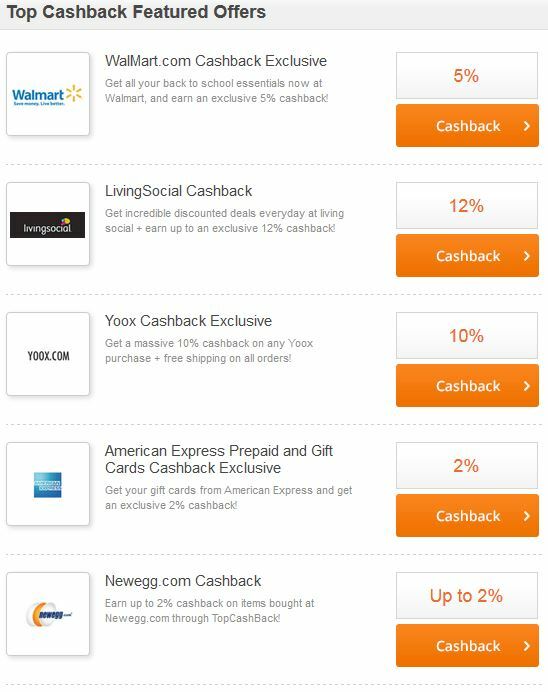 TopCashback.com promises to back up the bold claim of being the “USA’s Most Generous Cash Back Website” by offering to pay 100% of the commission they receive from the merchant. Most Generous Cash Back Site? The way that these cash back websites work is that they earn a commission on each referral. In other words, when you click a link and shop at a store through their site, they earn money. Other cash back sites will give you a portion of this commission money. TopCashback.com will give you all of it. Now, how will they stay in business if they do this? They are happy to just collect the income from a few ads on their site. I would say this is definitely quite generous. So far TopCashback.com has partnered with 2,400 merchants. If you shop at any of them, you will earn cash back on your purchase. Popular stores like, Groupon, Walmart, Best Buy, Target, GiftCards.com, Restaurant.com, Overstock.com, Bloomingdale’s, and many more are listed. You can also find current coupon codes to really stack your savings. Personally, I never shop online without checking for cash back and coupon code options first. That would be like throwing money in the garbage! There’s no minimum withdrawal threshold on payments. This means if you earn $.01 you can cash out. That’s great news since a lot of sites have pretty hefty thresholds that you have to meet before you ever see your money. Refer your friends to TopCashback.com and earn $10 per qualifying member. That’s a very generous referral bonus, too! There’s an iPhone app so you can save money on the go. It’s even more convenient to earn cash back when you shop now. There are a lot of sections to explore on the site. There’s even a place where you can earn without spending a dime. By filling out surveys or joining free programs, there are ways for you to earn a little side cashola. As a person who has been using cash back sites for years now, I find TopCashback.com to be quite user friendly. It’s easy to navigate and seems to have a lot to offer. I definitely noticed higher cash back offerings on several popular stores. I like their “Deal of the Day” section that pairs up coupon codes with cash back, too. Overall, I think this is a winner! >>> Sign up for TopCashback.com for free today. Stay social with them by liking their Facebook page and following on Twitter. You are speaking to me right now girfriend! I LOVE shopping with cash back sites! This is one that I’ve never heard of before, but you better bet that I will be checking it out! Awesome! I have been looking for ways to monetize my site. Thanks for sharing this. I will definitely be looking into it. I’ll definitely be checking into this further. Thanks for sharing it! i haven’t heard of this at all!! what rock have i lived under? i’ve used ebates for years but they don’t have everyone. i’ma lways looking for ways to save. Oooh thanks! I love cashback sites and hadn’t heard of this one before! I’m totally going to sign up for this – I always use cashback sites and I’m impressed that there is no minimum cashout threshold. I try to use cash back sites when I am shopping online but most of the time I am forgetful. I’ll have to remember to check this one out. Thanks for sharing! WOW.. thanks for sharing the new cash back site.. I love shopping and I love cash back.. sooo gonna check it out…. I’m glad for once I know about something before I see it on a blog! I like TopCashback as I’ve been a member for quite some time.